The RevAbs revolution has begun! For all those who want to take Brett Hoebel's ab-ripping workout to the next level and really make amazing gains, the Deluxe Package is the way to go. 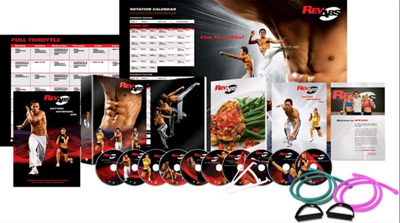 Containing everything from the basic kit plus some incredible extras like new extreme workouts and fantastic accessories, the RevAbs Deluxe Package is for the committed athlete who wants that shredded core NOW. What's Comes in the Deluxe Package? Ready to take it to the max? Not only do you get te full RevAbs package, but you will also receive two advanced workouts: Full Throttle Abs and Full Throttle Intervals; two superior-grade resistance bands for the greatest workout results; and ontop of all that, 2 FREE gifts: Anytime, Anywhere Abs 2, a handy workout to fire your abs when you're on the go, and the Full Throttle Calendar, which makes it easy to add your deluxe workouts to your RevAbs program. Celebrity fitness trainer Brett Hoebel has always had a passion for the human body. He studied biomedical science at the prestigious Claremont-McKenna college with the goal of becoming a doctor, and has used this knowledge of the human anatomy and physiognomy to perfect his famous 'Rev Abs' class. Voted twice as the #1 fitness class in NYC by New York Magazine, he has become the go-to guy for magazines such as Cosmopolitan and numerous TV shows.